The point of Shojin-ryori is knowing Zen! Shojin-ryori based on Zen Buddhism is a Japanese traditional vegetarian cuisine. Its origin is Daikyo-ryori(see The origin and history of five Japanese traditional cuisine) which is the oldest cuisine for nobleman in Japan. Shojin-ryori also called Buddhist cuisine was born for Zen Buddhist priests to achieve a spiritual awakening by training, and was repelling Daikyo-ryori's luxury. Shojin means studying and working hard at training. Originally, Gautama Buddha who was founder of Buddhism in India do not prohibit eating meat. He held to a middle course after experiencing both luxury life as prince and fasting as monk in training. He also permitted his pupils to eat meat. However, they did not fish and hunt because of five precepts of Buddhism, abstaining from killing living beings, stealing, sexual misconduct, lying and intoxication. They lives by Takuhatsu which is a traditional from of dana or alms. Takuhatsu has the two following purposes. One purpose is to live and train themselves. The another purpose is that a donor can practise virtue by it. Buddhist priests do Takuhatsu for common people because they can not train since they must work to live. Buddhism spread over China, and many sects appeared there. One of them is Zen Buddhism founded by Daruma. He said all things in everyday life is training in Zen Buddhism. Zen priests began to work and cook by themselves from 618 to 907. Buddhism spread over Japan in 552 according to the Nihon Shoki(The Chronicles of Japan) which is the second oldest book of Japanese history. It is said that primitive Shojin-ryori is also spread then. On the other hand, Emperor Tenmu prohibited priests to eat meat by law. The trend of vegetalian also spread among common people then. It laid groundwork for spreading Shojin-ryori. After that, Zen Buddhism came to Japan from China by Dogen in Kamakura period(1185-1333). He founded Soto sect based on Zen Buddhism, it became one of the three major Zen sect in Japanese Buddhism. He said to achieve a spiritual awakening by Zazen which is to sit in meditation. In addition, the priests training in Eihei-ji temple which is the head temple of Soto sect valued not only Zazen but also cooking various dishes without meat. Dogen thought both cooking and eating are also important trainings. 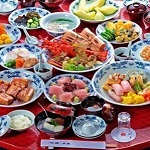 There are three rules to cook Shojin-ryori without using meat, five prohibited foods, using five tastes and cookings, and using five plates. The five prohibited foods(forbidden ingredients) are garlic, onion, scallion, leek and shallot. It is said that these excited one's sexual desire because of their smell. The five tastes are sweet, sour, hot, bitter and salty. The five cooking method are raw, boil, roast, fry and steam. These are used for bringing out the flavor of the raw ingredients called Awami from foods. The five plates are rice bowl, soup bowl, bowl with lid, flat plate and small plate having a base on a bottom part called Tsubakizara. A bowl with lid is used for aemono which is vegetables and seaweed with Japanese dressing. A flat plate is used for boiled dish or fried dish, Tsubakizara is used for Japanese pickles. Zen priests must chant Gokan-no-ge also called Shokuji Gokanmon(the five sentences for eating) before eating Shojin-ryori. Gokan-no-ge means thanks for meal and attitude of eating a meal. The spirit of it remains and spread over the whole Japan nowadays. That is the phrase which most Japanese say before eating a meal "Itadakimasu". "Itadakimasu" means "I eat" in English, but the meaning of eating "lives of creatures" is hidden in this phrase. Many people including some Japanese think Shojin-ryori is a dish without killing creatures. However, that is wrong because plants and fruits have lives in Buddhism. Priests kill them to cook Shojin-ryori. Why only meat and fish are prohibited to use in Shojin-ryori? The reason is the common people can feel a death of animal or fish when they cook them. People can not feel a death of plant because vegetables and fruits do not resist and scream when they are cooked. On the other hand, people can feel a death because animals and fishes move and say something before their death. People forget that sometimes in daily life. Priests give people a opportunity to remember that by talking about Shojin-ryori and eating it. Not to eat meat and fish is only an opportunity for common people to know and remember value of life. Priests kill plants by eating Shojin-ryori because plants live. They do not think that they eat Shojin-ryori without killing, they think that they eat it with knowing and thanking lives of plants. The point of eating Shojin-ryori is knowing that a human being kill many creatures to live. People who eat Shojin-ryori should thank for everything. Shojin-ryori consits the two mini table, Honzen and Nino-zen. Hon-zen is put the left side, Nino-zen is put the right side. That varies by sects and temples. Shojin-ryori of some sect consists only "ichiju-sansai(one soup and three dishes)"or "ichiju-gosai(one soup and five dishes)". Above menu is similar to Cha-kaiseki's menu, but the order of them and some menu are different. 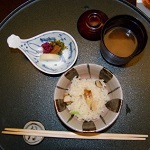 The first dish of Cha-kaiseki is rice because its origin is that Zen Buddhist was hungry. On the other hand, the first dish of Kaiseki-ryori is delicacies for alcoholic drinks because it is cuisine for drinking party. Of couse, it varies by resutaurants and course though above menu is standard. There are many restaurants to eat Kaiseki-ryori in Japan, not only Ryotei and Kappo but also hotel and Japanese-style hotel called Ryokan. Ryotei is an exclusive Japanese restaurant. It serves Kaiseki-ryori in a Japanese style reception room with straw mat called tatami on the floor. Kappo serves it in a counter table. Some Kappo restaurants serve not only full course meal but also individual dishes(à la carte). If you travel Japan, you can experience Japanese culture through Kaiseki-ryori. Note that a reservation is necessary for Ryotei and Kappo restaurants.